Need portability and extreme stability? Fluke Calibration Micro-Baths have both. We invented the Micro-Bath. 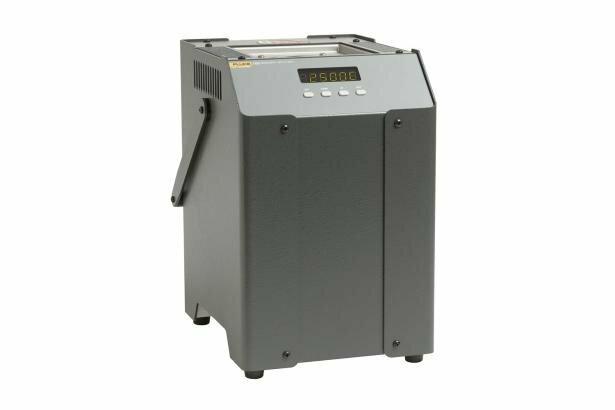 And, while many have tried to duplicate it, none of them use proprietary Fluke Calibration controllers, so none of them deliver performance like a Fluke Calibration bath. Micro-Baths can be used anywhere for any type of sensor. The 6102 weighs less than 4.5 kg (10 lb. ), with the fluid. It’s lighter and smaller than most dry-wells, has a spill-proof lid, and is easier to carry than your lunch. You can take it where you need to go without carts or excessive effort. Micro-Baths can even be transported with the fluid in them. Wherever you go with your Micro-Bath, you can count on its performance. Each model is stable to ±0.03 °C or better, depending on the fluid you use. Uniformity is ±0.02 °C or better for low uncertainties using a reference thermometer. Display accuracy has been improved to ±0.25 °C for quick calibrations without a reference thermometer. In short, you get the stability and precision of a liquid bath in a dry-well-sized package. Don’t be fooled by competitors who pour oil into a dry-well and call it a bath. Micro-Baths are maximized for true fluid-bath performance. With a 48 mm (1.9-inch) diameter, 140 mm (5.5-inch) deep tank, a Micro-Bath can calibrate any type of sensor including short, square, or odd-shaped sensors. The problems of fit and immersion are virtually eliminated by using a fluid medium rather than a dry-block calibrator. Micro-Baths are perfect for liquid-in-glass and bimetal thermometers. The 6102 has a temperature range from 35 °C to 200 °C, the 7102 covers –5 °C to 125 °C, and the 7103 extends from –30 °C to 125 °C. Stability, uniformity, and accuracy specifications cover the entire range for each bath, not just the best temperature. All Micro-Baths have RS-232 ports, come with our Interface-it software, and can be used with MET/TEMP II software (described on page 81). Also included are contacts to calibrate a thermal switch, eight set-point memory storage, ramp-rate adjust, and over-temperature safety cutout. You may have noticed we haven’t touted our CFC-free refrigeration. Yes, cold Micro-Baths are CFC-free, and also compressor-free. That’s right—no heavy, noisy compressor to lug around. We achieve our temperature range and stability with only one moving part. This means more durability and less weight. 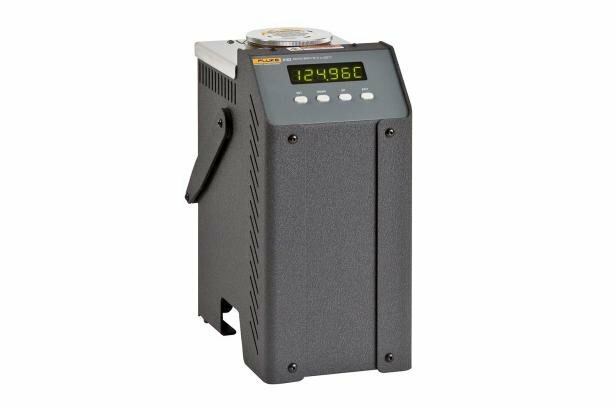 Fluke Calibration manufactures and sells temperature calibration baths of every size and shape, and now we have the smallest and lightest baths in the industry to go with the dozens of other models we make. Look at the specs, price, and value of these portable instruments and you’ll know why Fluke Calibration is the number-one company in this business.